Cost of construction max: In Vienna there are various housing markets. Subsidized housing differs significantly from free- financed housing in production- and sales costs, which make a comparison difficult. Wohnprojekt Wien is a subsidized housing. Due to its numerous community areas – which aren’t common to that extent – the housing is comparatively expensive. However, in comparison to free-financed housing it is much more affordable, as the housing includes vehicle sharing (cars and cargo bikes) shared food supply, childcare etc. Rental/sale cost compared to market price: With the conditions of state-subsidy for housing projects the total costs could be reduced compared with costs of the site, the costs per square meters etc. to the free market. In the current conditions the members pay basic and individual contribution, resident rent, the repayment of the building loan and running costs. The price per month lays under 10 Euros per square meter. For the project start each person had to deposit private funds of 570 Euros per square meter along with budget for communal facilities. The house is in use since December 2013 as a shared ownership. The Wohnprojekt Wien association acts as owner, jointly planer and administrator of the housing complex. Therefore, the house can only be sold in general; single apartments can not be marketed by the residents; the property goes back to the association. 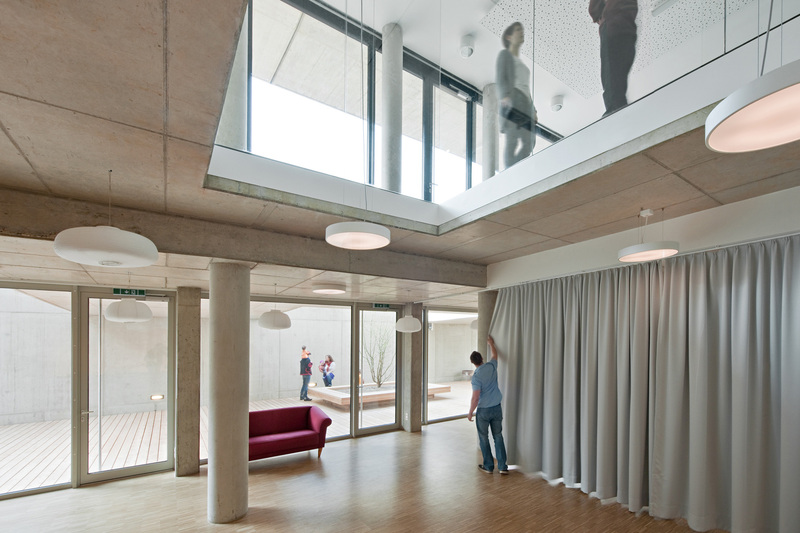 Rules of allocation: Wohnprojekt Wien uses the “Sociocracy“-model as internal form of organisation and decision-making. By using this model in the allocation-workshop, a sustainable decision in the allocation of the apartments was made. The founders did not have any prior claim; there was no “first-come-first-serve”. The house also finances two solidarity apartments, which are meant for people who would otherwise not be able to afford to participate in this project. Solidarity apartments have their own allocation rules as well as reduced rent. 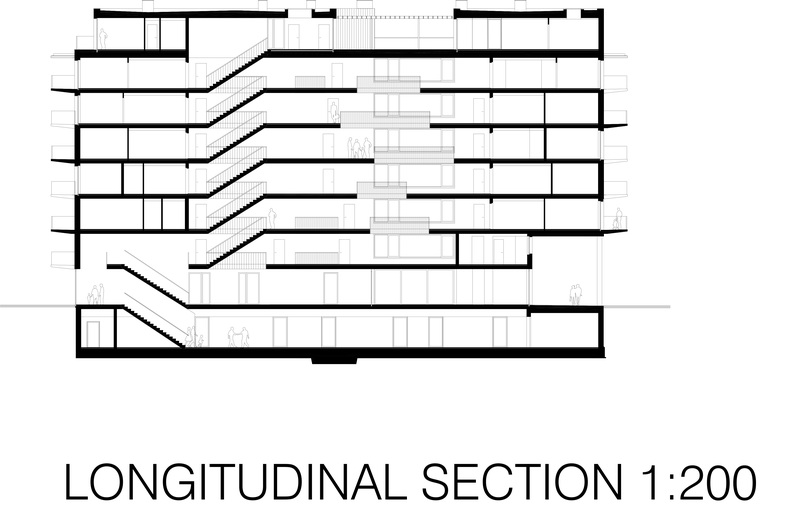 Protection of fragile categories: The project is hosting different models of living and working, multiple generations and diverse cultures under the same roof. 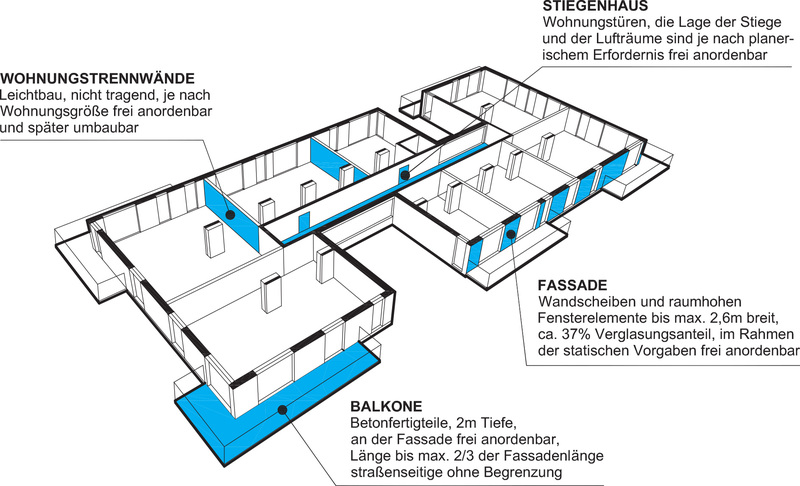 Wohnprojekt Wien offers supported apartments for people in need, such as refugees, single mothers or students. Involvement of inhabitants in the building process: The core of the project is a self-organised community and the shared dream to live together in a sustainable, collaborative and open-minded way. This way started from the very beginning with the participatory planning process of the communal spaces and the individual apartment units, continued with the creation of an alternative mobility system, a communal garden for the neighbourhood, and ended up with the communal ownership of the building, in other words with active participation during all the levels of the project´s development. Community accompaniment in the life of the building: The house is in use since December 2013 as a shared ownership. 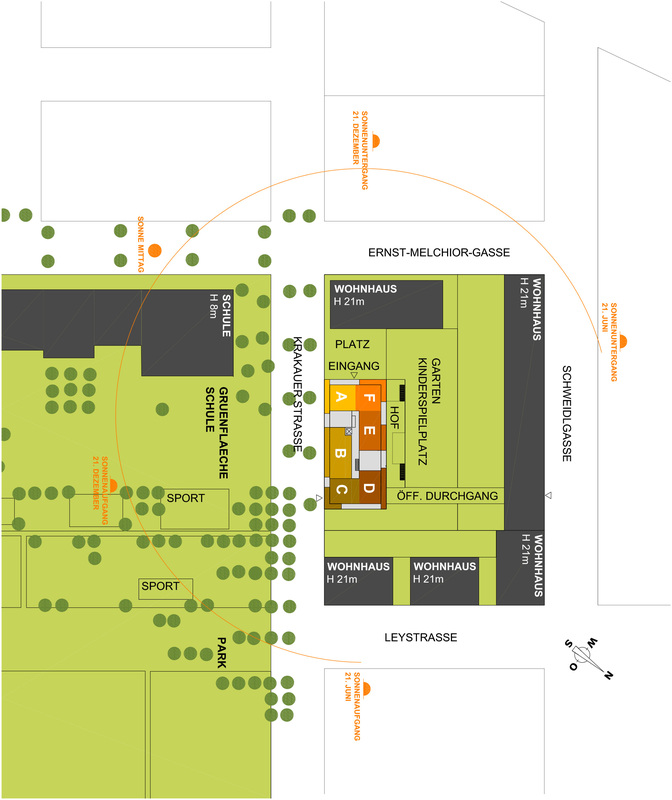 The Wohnprojekt Wien association acts as owner, jointly planer and administrator of the housing complex. The association members live in the flats. In all areas of communal life the members are actively engaged. The great communal life is supported initiatives and work groups, whether in looking after the garden or library as well as in organising diverse things like the booking of guest-apartments or the event hall. Functional mixitè: Examples: The local café with integrated shop is a meeting-point for people around the area and offers a cultural program. Event halls give space for cultural activities and are available to the public. 3 guest-apartments, can be used by the residents for their guests or be rented out to the public. Vehicle sharing with cars and cargo bikes, csa membership, shared ownership, supported apartments for people in need, cultural activities or a little shop as meeting point for the neighbourhood are further contributions. Common spaces and shared living: Examples: The local café with integrated shop is a meeting-point for people around the area and offers a cultural program. Event halls give space for cultural activities and are available to the public. 3 guest-apartments, can be used by the residents for their guests or be rented out to the public. Techniques and strategies for environmental saving: The main body offers a good basis for an energy – efficient building. The house could thus be implemented as a low-energy house with controlled ventilation and low-temperature heating. A photovoltaic layer on the roof is another contribution to environmentally friendly energy generation. More durable and ecological building materials (than commonly used in subsidized housing) were taken into consideration. The ventilated larch wood facade with mineral wool insulation is examples of this. In addition, a well is used for the use of domestic water. In the end of 2009 a committed group of 15 people came together, sharing the dream of creating a new way of living together in the city: sustainable, collaborative and open minded. The group organised a meeting once a month which was also attended by other interested people. As far as joint activities and spaces were concerned, a consensus was soon found. In order to acquire collective property in Austria and operate self-determined the co-housing group had to be established as a corporate association. To achieve this goal, they formed the „Association for a Sustainable Life” (Verein für nachhaltiges Leben). One of the initiators was Markus Zilker, who acted as a member and simultaneously as the architect with his office „einszueins architektur“. 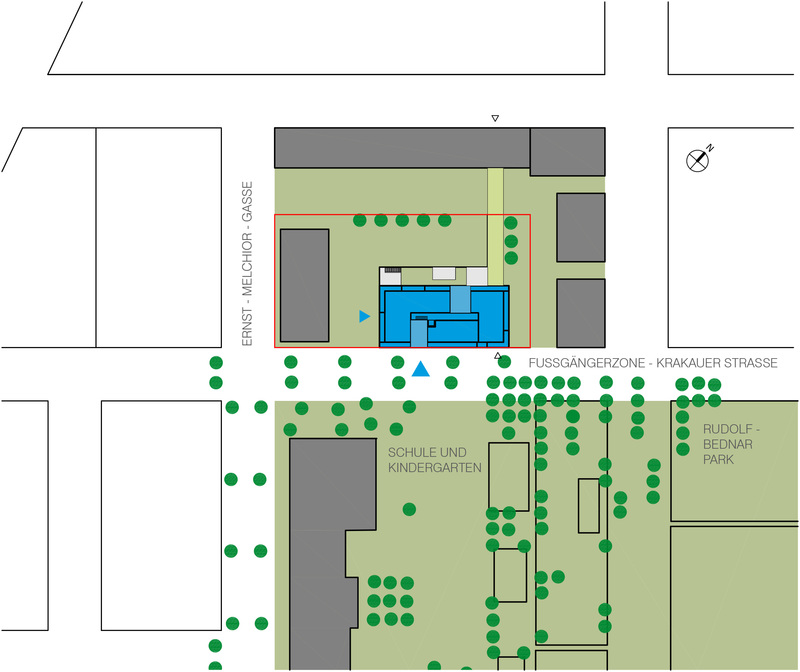 Plots in central positions in Vienna are extremely expensive on the free market. So it became clear that the group had to require housing subsidies from the City to realise the project. These subsidies could be obtained by a competition in which an architect and a developer take part. Essential for the project was the fact that urban subsidies were able to reduce the price of the site and ensure that the City provides reasonable loans. The group therefore looked for a developer who would be prepared to collaborate with them. At the same time the group were also focused in looking for a site in the North Station district of Vienna, firstly because a competition of this kind had been advertised in the area and secondly because sites of the desired size were available there. In this way the group found a partner in Schwarzatal Housing Association to collaborate, together with einszueins architektur. 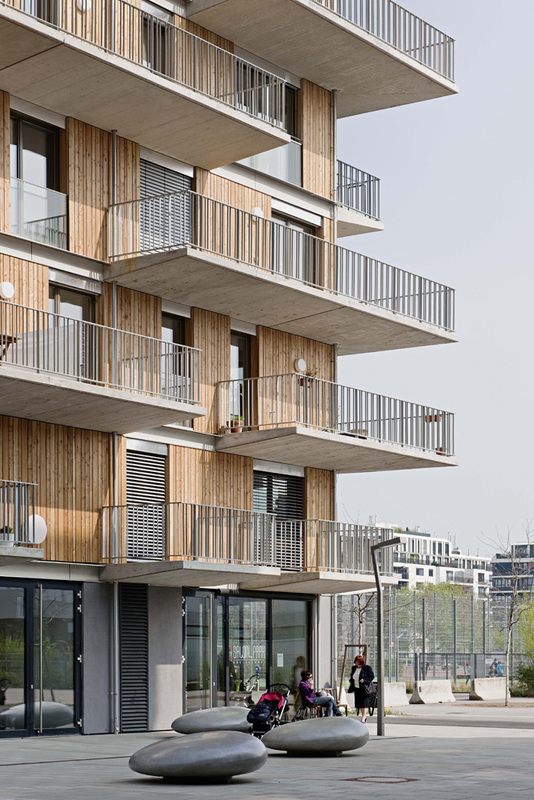 Wohnprojekt Wien is located in an newly developed urban area – the so called Nordbahnhofgelände – and acts as an incubator of sustainable urban living. The project represents a „Wohnheim“. Wohnheim stands for communal housing where additional special support can be claimed from the Vienna City Council. With the conditions of state-subsidy for housing projects the total costs are reduced compared with costs of the site, the costs per square meters etc. to the free market. 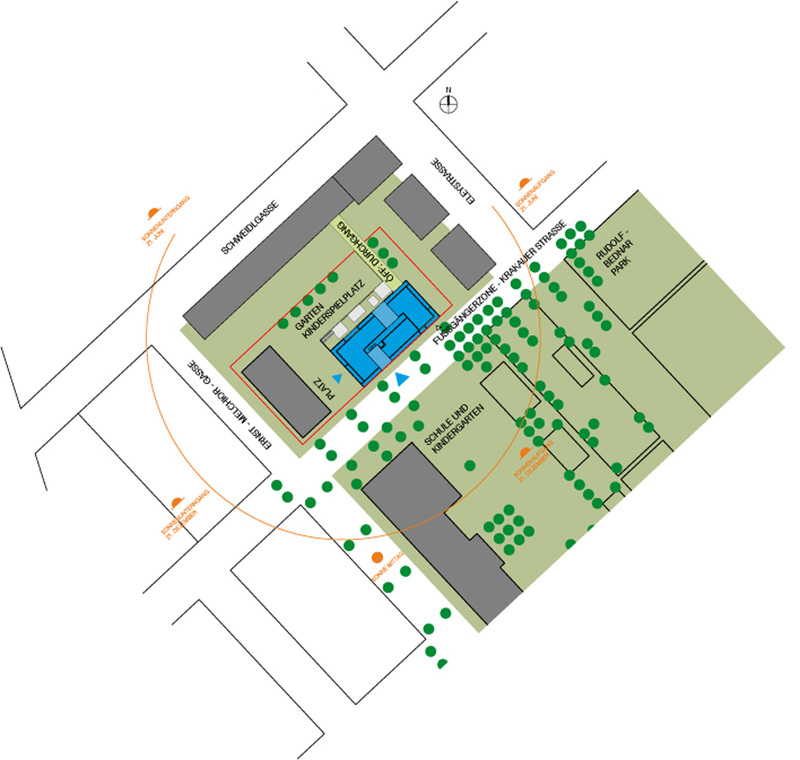 einszueins architektur were involved in the planning, participatory and construction process. The structural concept of the house as well as innovative cooperative methods allowed a high level of participation during the whole planning process from urban design to the electrical equipment. Everybody could plan his or her apartment individually, workshops were held for the community spaces and the interior of the flats. 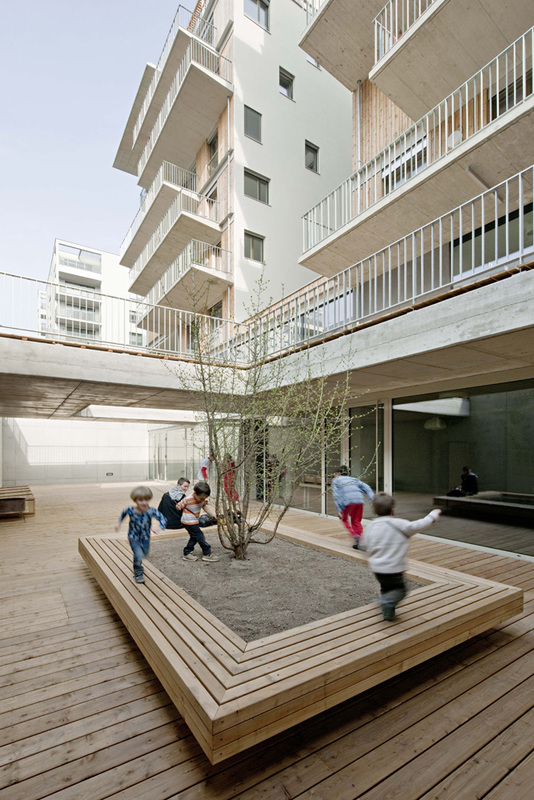 The result: a collaborative housing project for 67 adults and 34 children, finished end of 2013 and situated next to a park in the 2nd district of Vienna. 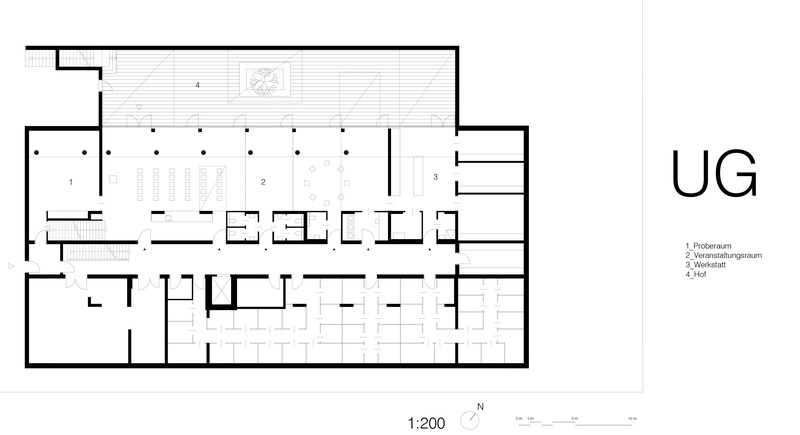 It holds 39 apartments from 36 to 150m², 400m² for trade or commerce and 700m² of community spaces. The association members live in the flats. In all areas of communal life the members are actively engaged. Beyond the communicative and sustainable architecture the project integrates many other ideas of sharing and social sustainability. Vehicle sharing with cars and cargo bikes, csa membership, shared ownership, supported apartments for people in need, cultural activities or a little shop as meeting point for the neighbourhood are further contributions.